The Haversack, W.E. Patt. 37, was introduced with Web Equipment Pattern 1937 with List of Changes entry No. §B1623, approved 8th June, 1938. 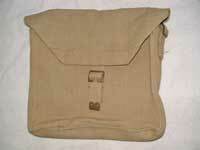 This Haversack was intended to be worn at the left side, when in Field Service Marching Order. It was much larger than the Patt. ’08 type, quoted in L. of C. §B1623 as “…1-in. deeper and 21/4-in. wider than the patt. ’08…”. The terms were poorly chosen as deeper ought to be higher, allowing wider to be deeper (meaning front-to-back), leaving the term wider to mean side-to-side, as this dimension was identical to Patt. ‘08. It was provided with weather flaps. These tapered on the forward edge, being an extension of a slight taper on the upper front edge of the sides. It was divided from side to side, with a second divider splitting the section furthest away from the wearer’s back. This gave accommodation for the new Bottle, water, aluminium (in its Carrier), next to the new aluminium Tins, mess, rectangular, which were a nested pair. 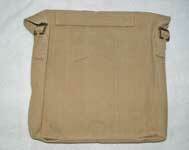 The latter were contained in a drawstring bag, in K.D., the Cover, mess tin, rectangular. Both Tins and Cover were the subject of a July 1938 Corrigenda and were inserted into the list of webbing items! The internal divisions derived from the larger Rucksack, upper part, No. 3 Equipment. When L. of C. §B2656 was approved on 27th June 1939, introducing the Officers’ Haversack, the original Haversack became “All Ranks”. Just to re-iterate the point made in the Introduction, that Patt. ’37 was not really a new design: within Patt. ’37, the Haversack was the only really new design. Manufacturing economies saw the elimination of Tips, brass, 2-in.on some Haversacks. The example shown here is maker marked "M.W. & S. Ltd." and dated 1942. Early documentation added a final line to the List of Patt. ’37 items being introduced. This was a Patt. 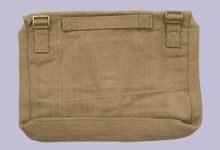 ’08 Haversack, but with its flap corners re-folded into a large point, secured with a single 1-inch strap and buckle. In place of the 2-inch side buckles, 1-inch buckles and chapes were stitched on. The extended sides now became weather flaps, whilst the rear face was without the 2-inch web tabs. A carrying handle, in 1-inch webbing was stitched at the upper rear face. 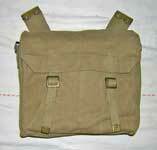 On the example shown here, manufactured in 1936, this is plainly a completed ’08 Haversack converted, the inked-on stitch guide lines showing where the rear tabs were removed. However, the example illustrated with the officers’ set in the instructional pamphlet may be “new manufacture”, simply finishing-off an ’08 to the modified standard. From the Allen Prior Collection, photographs © Allen Prior 2008. In 1938, the ’08 Haversack (modified) was intended for use by Warrant Officers, Sergeants, Company Quartermaster Sergeants, Battalion H.Q. clerks, the Intelligence Section, and for certain Corporals, plus motor cyclists and a rangetaker, spread across Nos. 1 - 4 Platoons. No mention of any officers was made. List of Changes entry No. 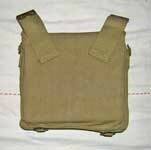 L. of C. §B1623 still made no mention of either an Officers’ Haversack, or the modified ’08 Haversack. It was then confirmed that a free issue of Patt. ’37 would be made to all Regular officers (of all Arms), together with Reserve officers, when the latter were recalled. Officers of the Supplementary Reserve, who already had a set of Sam Browne equipment, as at 31st December 1938, would also receive a free issue. However, officers commissioned after that date, would have to buy a set, using their outfit allowance. The modified Patt. ’08 Haversack was “…for carriage of papers, message pads and other articles required by Officers…”. 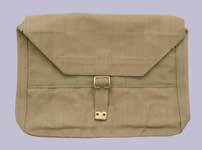 The modified Haversack is never mentioned in any L. of C. and seems quietly to have morphed into the revised design of Haversack, officers’, which was introduced by L. of C. B2656, approved on 27th June, 1939. This added the sub-text that it was also for certain W.O.’s and N.C.O.’s. Then a change of mind and by L. of C. §B4049, approved 31st August 1940, the Haversack was made obsolescent, with those issued being required to be returned to the R.A.O.C.. They were now to be issued in lieu of Haversacks, O.S. to Other Ranks. Then in 1941, L. of C. §B4730, misleadingly dated the same as §B4049, directed that it was to be re-introduced for officers! Those that had been issued to O.R.s were now to be withdrawn from them. In shape, it was the modified Patt. ’08 Haversack, but the 1-inch buckles were now on chapes stitched to the rear face. The carrying handle was retained in this new design and a half-depth external pocket was stitched to the front face. This was divided vertically, off-centre, these open-top pockets being closed by a press stud. The example shown here is maker marked "M.E. Co." and dated 1943. From the John Bodsworth Collection, photographs © John Bodsworth 2009.